Published: Nov 13, 2017 · Modified: Apr 11, 2019 · By Jen Sobjack · This post may contain affiliate links. 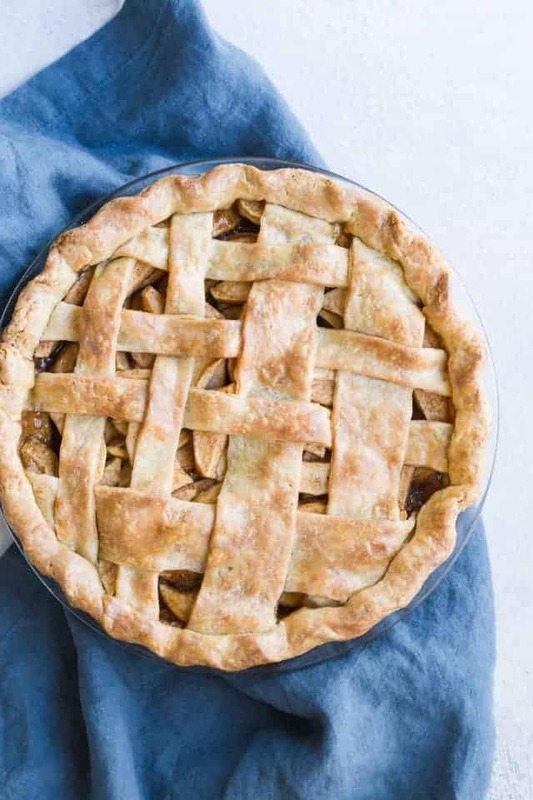 An Apple Pie with Brown Butter Crust will make your holiday or party spread complete. Gooey cinnamon apple filling nestled in a rich brown butter crust that is sure to be hit! Do you remember this apple slab pie with brown butter crust? Now you can have all those delicious flavors in a pie that regular size! The slab pie is good for feeding a crowd while the regular pie is great for a small gathering. Or you can just eat it all yourself. No judgment here. My favorite thing about this pie is the brown butter crust. Have you tried this crust yet? It adds SO MUCH FLAVOR to any pie. There’s not really much difference between today’s pie and the slab pie. Basically, it’s just a reduced version. You should try my apple cranberry pie after this one! For the filling, most of the ingredients are the same. I did use all brown sugar in this version instead of a mix of brown and white sugar. I love that deep flavor contrast from the molasses in brown sugar. I left quite a bit of cinnamon in the filling as well, only reducing it by half a teaspoon. A smaller pie doesn’t mean we need to sacrifice flavor. As with all my apple pie recipes, you can use any variety of apple you like. Pink Lady is my top choice but on rare occasions, I’ll mix that with Granny Smith. The crust is obviously, my favorite as I mentioned above. It’s so good, it has a place of its own here on the blog. Be sure to read through all the tips and tricks for making brown butter pie crust before you get started. I add an egg to the crust to make it sturdy. You could skip this all together but I love the how it helps the crust hold up against the gooey apple filling. There are a couple extra steps to making brown butter crust so it’s always a good idea to plan ahead. The butter needs to be cooked until it turns golden brown. Then it needs to be frozen until t’s set and this can take close to an hour. My suggestion would be to make the brown butter the day before you plan to make the crust. 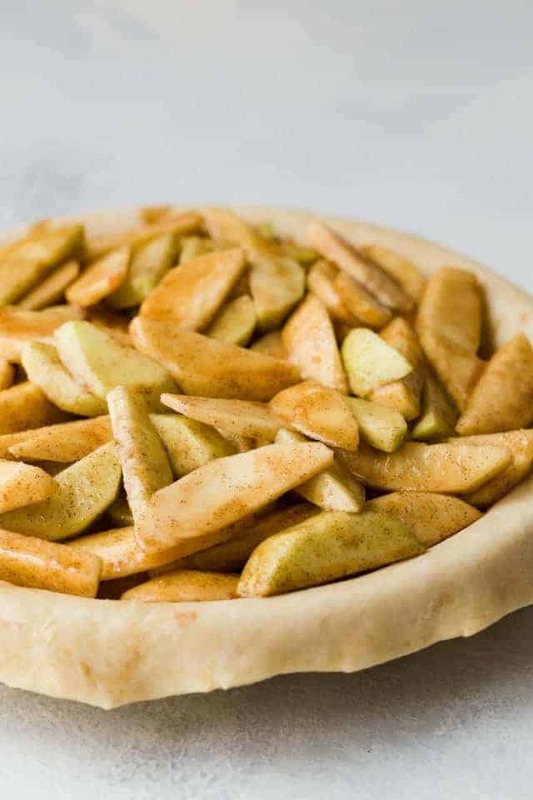 Top the pie with any pie crust design you like. I chose to use a lattice topping so you can see the hot bubbling apple filling! 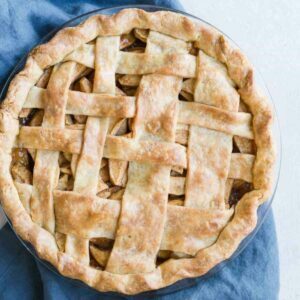 You simply can’t go wrong with a brown butter apple pie! Heat the butter in a small saucepan over medium heat, whisk frequently. Continue to cook until melted. The butter will foam and then subside. Cook until brown bits develop in the bottom of the pan and the butter turns a light golden color, about 8 minutes. Remove from heat. Line a small bowl with foil, letting some excess to hang over the sides. Pour the brown butter into the bowl, leaving behind the dark bits in the bottom of the pot. Freeze for 1 hour. Remove the solidified brown butter from the bowl and cut into small chunks. In a large mixing bowl, combine the flour, sugar, salt, and brown butter. Use a pastry cutter, fork, or two knives to cut the butter into the flour until the mixture resembles coarse crumbs. Whisk the eggs and ice water together until well combined. Drizzle over the flour mixture and toss with a fork until the dough comes together. If the dough is too dry, add more ice water, one tablespoon at a time until moist enough to stick together. Divide the dough into two equal size balls. Flatten each into a disk. Wrap in plastic wrap and refrigerate for at least 30 minutes or up to 2 days. Set the oven rack to the lower third position and preheat to 450°F. On a lightly floured surface, roll one disk of dough into a 12-inch circle. (A silicone rolling pin works great for this!) Carefully transfer the dough to a 9-inch pie pan, pressing it into the bottom and up the sides of the pan. Refrigerate for 15 minutes. In a large mixing bowl, combine the apples, lemon juice, sugar, flour, and cinnamon. Stir to evenly coat the apples. Spread evenly into the prepared crust. Carefully thread the dough strips over and under to create the look in the pictures above. Press the edges of the strips into the bottom pie crust edges to seal. Use a small knife to trim off the excess dough. Flute the edges as desired. Bake for 10 minutes. Reduce the heat to 375°F and bake for 35 minutes. Whisk the egg yolk and milk together and brush it over the top of the crust. Bake for another 20-25 minutes or until the crust is golden brown and filling is bubbly. Cool on a wire rack for 30 minutes. Serve warm or at room temperature. 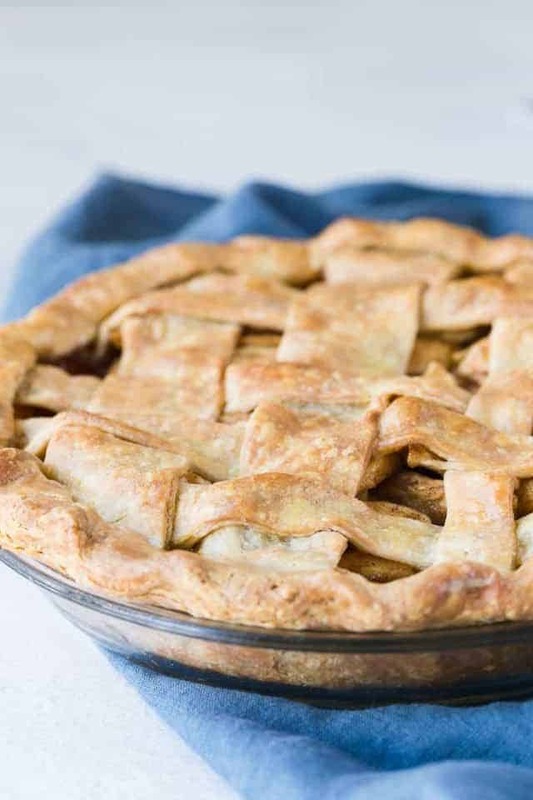 The pie dough can be made ahead of time and stored in the refrigerator for up to 2 days or in the freezer for up to 3 months. Thaw in the refrigerator overnight. Fully baked pie will keep for up to 3 months stored in the freezer. Thaw in the refrigerator overnight and bring to room temperature before serving. 1. Use your favorite apple or any combination of apples for a unique flavor profile. 2. Tent with foil, if the top crust begins to brown too quickly. 3. 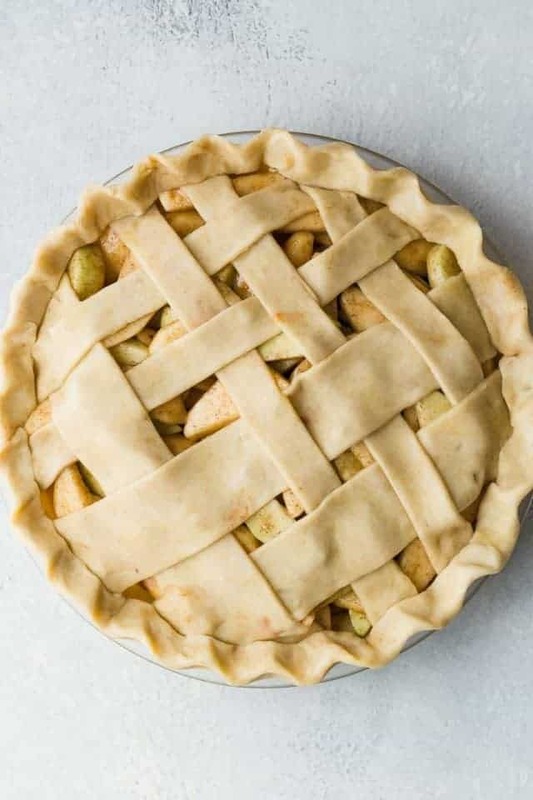 You don’t have to make a lattice crust. You can cover the filling with the 12-inch pie dough circle. Cut slits in the top for steam to vent then trim and crimp the edges.